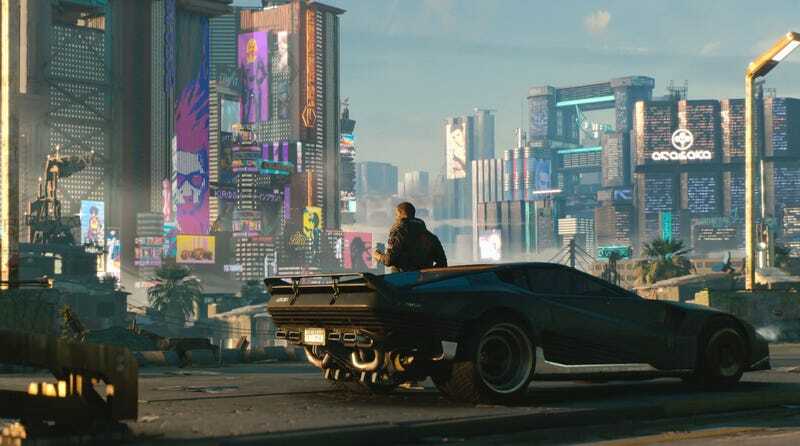 As part of today’s Microsoft E3 press conference, Witcher developer CD Projekt Red showed off a new teaser of its next monster-sized, but also monster-free RPG, Cyberpunk 2077. The trailer began with a male character saying that his city is the worst in America, referencing a “sky high rate of violence” and “more people living below the poverty line than anywhere else.” He added, however, that everybody still wants to live there because the city has something to offer everybody. We then saw scenes of futuristic characters fighting, applying makeup, playing pool, sparring with robots, getting into shootouts, driving, and having cool mohawks—all across a sprawling cyberscape of a city. “It’s a city of dreams, and I’m a big dreamer,” the narrator (and presumably main character) said. Sadly, Geralt never handsomely burst out of the shadows or piloted a sci-fi hovercraft that looked suspiciously similar to a bathtub. I guess he really is retired. For now.